On the 4th June 2018 the law changed, allowing learner drivers to gain motorway experience before they pass their driving test. As a Driving School we always provided our pupils the option of taking lessons with us after they had passed their test. The vast majority of our pupils took up this opportunity by enrolling on ‘Pass Plus‘. This is our prefered option as it allows you to concentrate upon getting through the Driving Test and building that much needed driving time before embarking on Motorway driving. 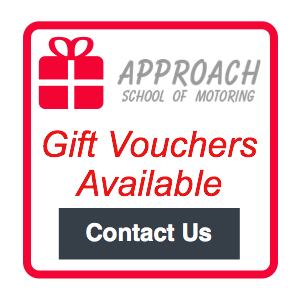 Approach School of Motoring can add motorway driving to your lessons if you wish. Motorway driving lessons will be a natural progression from dual carriageway work. Our focus will be on keeping the Motorway driving lesson real and looking at how to deal with different scenarios that may only be experienced on a motorway, for example, multiple lane choices, overtaking larger, slower vehicles and reading road signs unique to the motorway network. Please discuss this option with your instructor.